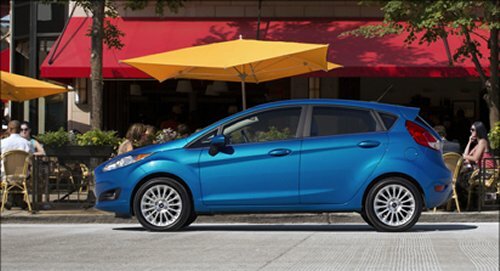 The EPA's numbers are in for the 2014 Ford Fiesta and they best everyone else in this contentious, fuel-sipping category. The Environmental Protection Agency's test results are published and the 2014 Ford Fiesta has achieved the best highway fuel economy in the subcompact class, becoming the only car to officially beat the 40 mpg threshold in the segment. The best-in-class fuel economy numbers are for the 2014 Ford Fiesta SE with the Super Fuel Economy Package, which returned a 41 mpg highway rating thanks to its 1.6-liter engine and hyper-efficient PowerShift six-speed automatic transmission. The overall ratings for the car were 30 mpg city and 34 mpg combined (EPA numbers). In the subcompact class, fuel economy is often the number one reason for a purchase and is nearly always in the top three considerations for new buyers. Also coming to the 2014 Fiesta's lineup is the 1.0-liter EcoBoost engine as an added option for the model's drivetrain lineup. The Super Fuel Economy Package adds improved aerodynamic additions, largely in the undercarriage shields and lower grille. A rear spoiler and side air deflectors also improve airflow around the Fiesta SE. The PowerShift transmission is another technological upgrade from Ford. This dual-clutch automatic is basically two manual transmissions in one, working in parallel, with computer-controlled fast-clutching in a dry configuration. The new 2014 Fiesta also includes the award-winning MyTouch system from Ford as an option and Ford's new MyKey system for parental control of the car's use. This control includes muting the stereo until seatbelts are fastened, setting a maximum speed for the car, etc. The new 2014 Ford Fiesta hits showrooms later this year.